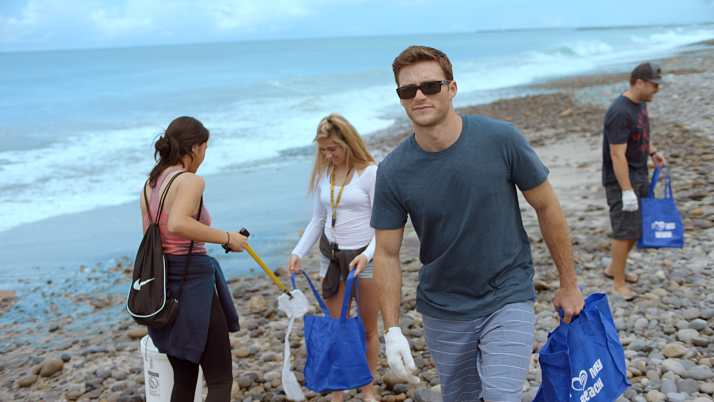 To raise global awareness of International Plastic Bag Free Day on July 3 - DAVIDOFF Cool Water ambassador and actor Scott Eastwood will take part in a beach clean-up at thein San Diego this weekend. DAVIDOFF partnered with the National Geographic Society’s Pristine Seas campaign to also release an exclusive short film with Eastwood. The film highlights Eastwood’s involvement in the ocean conservation partnership and features footage from the campaign’s most recent San Diego beach clean-up, where he was joined by local school children. The video was shot on location near Eastwood's home in San Diego and features him teaming up with local children for a beach clean-up with the Surfrider Foundation. Eastwood - a surfer in his own right - feels a special connection with the ocean having been born in California and raised in Hawaii. The inspiring message of the film is that we all have a part to play - which is why this summer 2016 DAVIDOFF Cool Water will be promoting beach clean-ups and encouraging individuals to demonstrate their love for the ocean and to contribute to change in the US and countries around the world. Since the start of the initiative in 2012, DAVIDOFF Cool Water has mobilized its millions of loyal fragrance users worldwide around the "Love the Ocean" campaign, with the commitment that each bottle of DAVIDOFF Cool Water sold will help protect 10,000 m2 of ocean. In the past four years, DAVIDOFF has supported 14 "Pristine Seas" expeditions that have resulted in five marine protected areas totalling 2.18% of the world's oceans. Currently, 2.18% of the world oceans are protected by the Pristine Seas campaign. By 2020, the global goal is 10%.